 I was really blown away with the service and professionalism that I received from Stacelynn. I felt like she was knowledgeable, organized and was able to (and continues to) answer all my questions. She was very fast in her responses and was able to create a Shop for my brand that was beyond my expectations. I would highly recommend her. Kelley at Misty Blue Farm Botanicals needed a brand new site to showcase her all natural skin care - and beautiful new branding! Only 1 week to complete! For this package your fee is due upfront to secure your spot, but is refundable minus a convenience fee if you need to cancel prior to the start date. Be sure to also budget for Shopify's ongoing monthly fees - totally worth it by the way. When your start date comes up your site will be ready in one week - awesome huh? Of course this assumes we have all of your homework the week before (check out our reschedule policy below). You have an additional two weeks to have me adjust your DNS settings (fancy way of saying 'put the site on your domain'). Otherwise I'll send you instructions on how to do that yourself when you're ready. What if I already have a Shopify site? Many Maker Package clients already have an existing site, but just need someone to step in and help take it to the next level. I will do a thorough clean-up, organize all of your existing pages and products, optimize your collections, make suggestions on how to increase sales, and add all of those special touches that will make your site work better for you. A few things aren't included in this package: copywriting, stock images, branding (like logo design) or significant graphic design, photo manipulation or resizing, a collaborative design process (the back and forth stuff that comes with the Custom package), training, code changes to the theme, bespoke web design. Email me if you have something in mind and wonder if it's included! But please note that this theme is intentially 'light', without the overload of a Premium theme. It is perfect for most beginners. Many shop owners will want to reach new heights when business starts to grow exponentially - we will often suggest that you move to a more robust theme when that happens. Luckily you'll find lots of help there too! Can I just purchase the theme and do the rest myself? Can I pick a different theme? Our Maker package includes our custom-created theme. Years of experience and feedback from artisans, makers, and entrepreneurs have all gone into its creation! Many of the off-the-shelf Shopify themes try to address the needs of every industry - from Car Parts to T-Shirts. This one was crafted JUST for entrepreneurs like you. No unnecessary features and functions that just complicate things and confuse you. 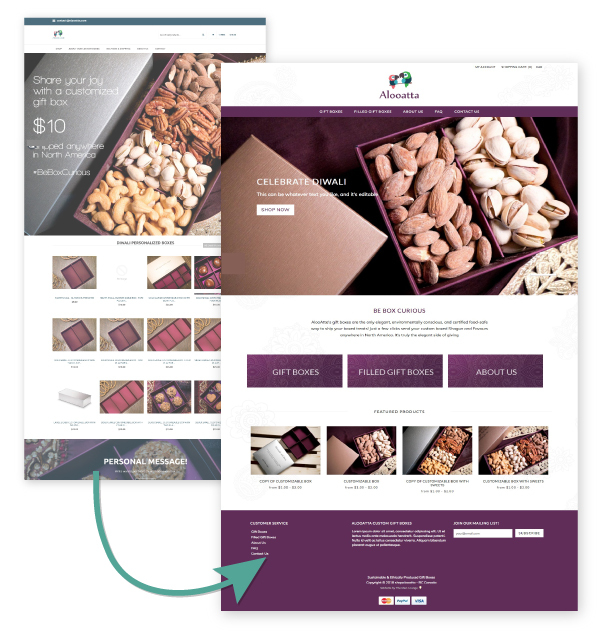 Check out our blank version of the theme and imagine it showcasing your beautiful products! Absolutely! We've included an assortment of settings and customization tools that will allow you to change almost any element on your site - without needing to call in the big guns. But of course I'm here to help if you need it. What is the refund/reschedule policy? I require full payment for this package to book your spot. But if you change your mind just let me know prior to your start date. We'll refund your package minus a $200 cancellation fee. Once we start working there is no refund available however. You can also opt to reschedule your project with advance notice. One reschedule is permitted at no cost. Additional rescheduling has a $200 fee. Your site will be created using our in-house, proprietary theme: a clean, easy to use framework which includes all the features you’ll need to succeed. No more ‘feature fatigue’ that comes with most Shopify themes. We created this theme with your vision and needs in mind.